Babymetal are set to star in an animated series which will see them try to “save the day” as the “magical world of heavy metal music” comes under attack. Warner Bros President of Animation, Sam Register, says: “Babymetal have to be seen to be believed – a mind-blowing, fun combination of pop vocals, heavy metal music and dance choreography brought to life by three incredibly talented teenage stars. It is not yet clear where the series will be broadcast. It is produced with the help of Babymetal manager Key Kobayashi, aka Kobametal. The official description of the series reads: “The action-adventure will take viewers inside the magical world of heavy metal music as it comes under attack, and one lonely god, Kitsune, forms the warrior band Babymetal to save the day. 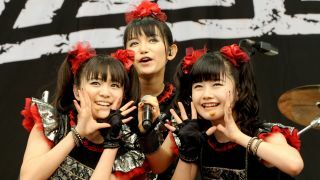 Earlier this year, Metal Hammer readers voted Babymetal’s self-titled debut as the Greatest Album Of The 21st Century. The Japanese trio’s second album Metal Resistance was released in April of this year. They played two nights at the Tokyo Dome this month and will support the Red Hot Chili Peppers in the UK in December.